Tim Fuller didn’t celebrate Tuesday’s Super DIRTcar Series Modified victory at Eldora Speedway when the checkered flag fell. It was a green light that made him smile. 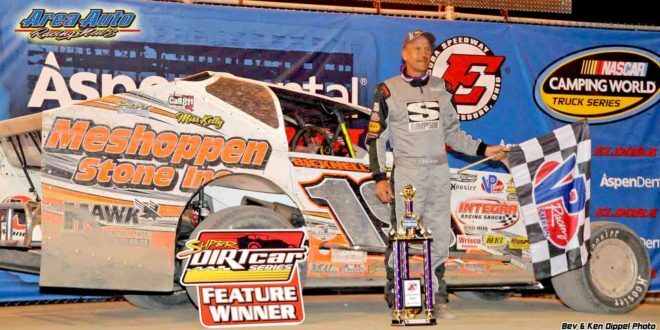 When the late night race ended just before 1 a.m., the driver from Watertown, N.Y., wasn’t secure that the $6,000 first place prize was his until he crossed the scale, made post race minimum weight and turned on a green light signifying he was legal. Fuller remembered that Scott Bloomquist was stripped of a $100,000 Eldora payday in 2015 when his Late Model came up light after winning the Dream race. He didn’t want history repeating itself. Tuesday’s race, which had taken one hour to complete, included many non-counting laps run under caution. Fuller wasn’t positive if Dave Rauscher’s No. 19 Bicknell chassis Modified would make the minimum weight. “We were having so many cautions I didn’t know if it would ever get done,” said Fuller. After the track was redone for the feature, the good handling Modifieds were running wide open for the first 20 laps. Fuller said his car ran hot during that period. To help get it cool during caution flags he revved the motor high, but this also used extra fuel. In the end he had saved enough fuel to see the green light. Afterwards his crew found seven gallons of racing gasoline remained. Anything less than five gallons and he would have been found illegal. “I was going around the bottom on cautions trying to make it as short as possible to save fuel,” he said with joy.